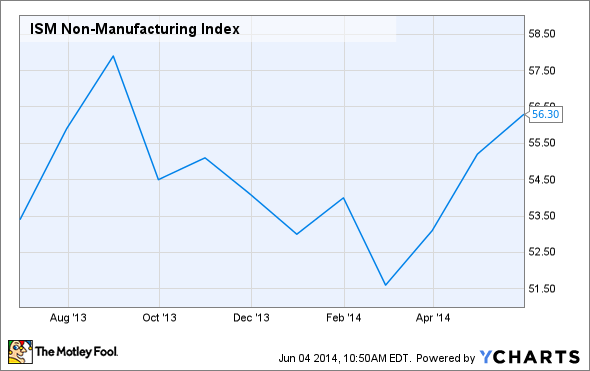 ISM's latest report shows stronger employment and more new orders. The services sector improved in May for the 52nd consecutive month, according to the Institute for Supply Management's (ISM) Report on Business released today. The Institute's Non-Manufacturing Index registered an overall 56.3% rating, up from April's 55.2% and above analyst expectations of a smaller improvement to 55.5%. An above-50 rating denotes growth, while less than 50 implies contraction. Diving deeper into index components, business activity picked up 1.2 points to 62.1%, new orders jumped 2.3 points to 60.5%, and employment improved 1.1 points to 52.4% for the third straight month of faster growth. May's boost in new orders bodes well for the future of the services sector, while its employment numbers provide more evidence that Friday's jobs report could paint a pretty picture. Of the 18 services industries included in the Institute's survey, 17 reported growth for May. Construction claimed the largest improvement, followed by wholesale trade. A construction survey respondent noted that the "[m]arket is picking up with large construction projects for the second half of the year." Mining was the only services industry to report an economic activity slowdown.